The IoT location enabled Satalyst Tracker gives testimony to the power of the Microsoft Azure IoT Suite to move quickly from prototype to delivering an innovative and ready to use custom solution. The Satalyst Tracker IoT solution is transforming the way spectators engage with cycling. Pair the rise of cycling with today’s fixation on tracking performance, and the role of data in cycling can’t be ignored. Tracker pulls all the data and insights together for richer engagement from pedal to the spectator. 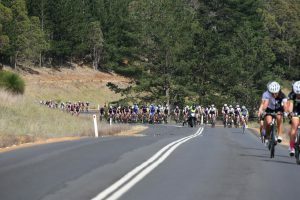 Spectator engagement is important to Cycling Eventures, organisers of the Tour of Margaret River (ToMR). There’s around 600 riding in this annual race, but safety and economics are seeing this number push capacity. A cap on riders poses a quandary, as it means finding other profit channels to grow the event’s profile and audience to attract sponsors. “We want to engage spectators during the race by giving commentators something to talk about, like where riders are on a map and what speed they’re doing,” requested event manager, Brendon Morrison. It’s a long race spanning 230 kilometres. Exciting for cyclists, but not so much for spectators who see riders fleetingly and then not for hours when commentators struggle to engage them with sparse information. Showing riders on a map is interesting, but there’s potential to give way more. Each rider is guaranteed to have some type of performance tracking device like a power meter or heart rate monitor. With 600 riders, there’s copious amounts of devices embedded with technology collecting all sorts of data. What if the data could be captured and shared live with spectators? Satalyst recognised a perfect IoT opportunity for remote monitoring and reporting on location and performance of riders and built an Azure based solution using Azure IoT technology. Azure facilitated rapid prototyping and within 5 weeks the solution moved from proof of concept to real-life deployment. 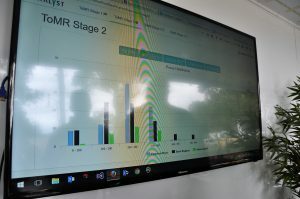 Dubbed the Satalyst Tracker, it was launched at ToMR in November 2015. 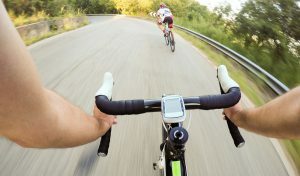 Tracker uses a mobile phone to grab data from existing sensors on bikes and riders. The low power means the phone’s battery sustains Tracker as riders carry the phone and data is transmitted in real-time using data links to Azure. Data is securely ingested with Azure IoT Hub and stream processed in real-time. Azure Cache provides temporary storage with fast access during processing and Azure SQL provides long-term storage of all data ingested and created. Data output is presented on Azure websites for presentation on any internet enabled device. 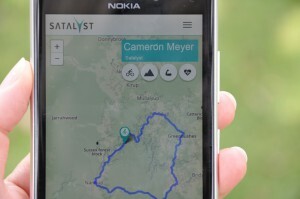 Azure IoT and a simple mobile phone was the game changer and allows Satalyst to replicate the solution within the bicycling industry. The Azure IoT Suite provides preconfigured solutions enabling a faster development time and the Azure IoT Hub provides the scalability and security to ensure rider data is safely ingested. The mobile phone and cloud enabled Tracker means there’s no need for expensive hardware; just compatible devices and internet access. But the brilliance sits with the IoT technology – it democratises access to device data and the associated insights for sharing and engaging a wider audience. A brilliant solution for engaging spectators at any cycling race in the world. Satalyst’s technology tells us how riders are performing the moment it’s happening. We see stuff like this in Tour de France! Product Development - what to measure and when?